I have purchased a voucher and want to book a date to use it. I am Booked on a Rock Climbing Introduction, Where do we meet? 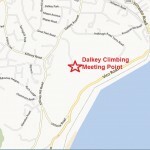 We meet at Dalkey Quarry CarPark at 10am. This is easily found off Dalkey Avenue. Look out for a small roundabout with a Height restriction prior to entering the road to the car park. I am Booked on a Rock Climbing Introduction, What should I bring / not bring? Please bring suitable clothing such as that worn to jog or to the gym. Please leave all valuables at home and remove all jewellery especially rings and necklaces as these are a hazard. Please also bring food and drink for the day as there is no nearby location for food. Please be aware there are NO toilet facilities and anyone wishing to use the bathroom will need to make a journey to Dalkey Village or the local cafe. People of all ages, shapes and sizes enjoy rock climbing. Its untrue that you have to be a muscle bound gym god to take up rock climbing. Rock Climbing is far more about mental control, a positive attitude and determination. Sure if you keep at the sport you will get fitter and tone up but think of it closer to Yoga than Weight Lifting! I've booked a Rock Climbing Intro. What gear do I need? We supply all technical equipment. You will need loose fitting clothing such as a track suit, outdoor clothing suitable to the time of year such as a rain jacket and fleece and training shoes with laces. We recommend you stay away from wearing jeans as they tend to constrict movement and be cold if they get wet in a rain shower. Depending on the activity it may be nessasary to cancel and re-schedule the activity for safety reasons. We will always leave cancelling an activity to the last moment to try and make best use of weather predictions and changes. If we have to postpone the activity then we will re-schedule at the earliest possible date. Rock Climbing is not suited to rainy conditions and can reduce safety factors. We will always make decisions based on safety and can offer no apology for this. All the sports we indertake are adventure sports and as such have a risk associated with them. However we utilise skills and techniques that reduce these risks to an absolute minimum. Statisticaly you are far more likely to have an injury travelling to or from our courses than on them. As high lighted above our instructors are highly trained and qualified to ensure you a safe and enjoyable adventure. What qualifications do your instructors and staff hold? All the staff at Vertigo Outdoor hold qualifications suitable for the activity they are leading. This can be a Single Pitch Award Holder (SPA) for Rock Climbing Introductions, A Mountain Leader (ML) for the Mountain Skills, Navagation and Hill walking courses and a Mountaineering Instructor (MIA) for courses such as learn to lead or course Assessments. We may have trainee instructors assisting in activities from time to time but under the careful eye of one of our senior instructors. In addition to this all staff are Garda Vetted and Child Protection and First Aid trained. YES. Our staff are not only committed climber, mountaineers, paddlers and more but they have spent many years being trained in best practice and safety of there relevent disiplines. Being a great climber or hill walker is not enough. You need a vast range of skills to ensure a client gets the best day possible in the hills or mountains. YES. Please see the following that explains all the qualifications in detail including some excellent videos.